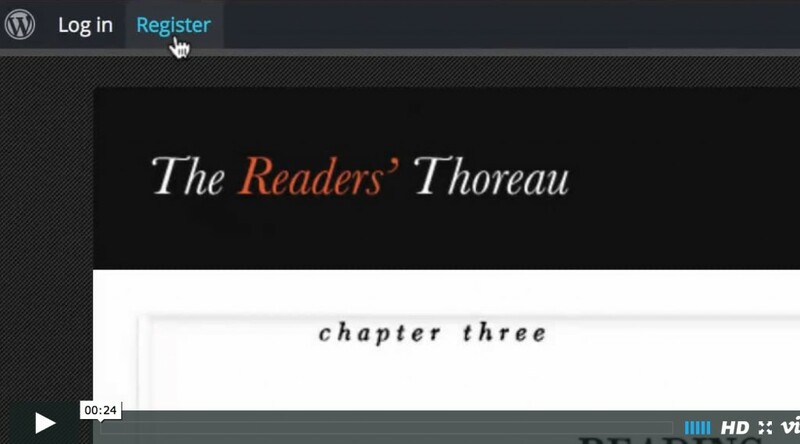 The Readers’ Thoreau is a social network for reading Henry David Thoreau’s works collaboratively. Thoreau wrote in Walden that we should read books “as deliberately and reservedly as they were written.” Reading them in conversation with other readers is, we think, one way to follow that injunction. Once you join the network, you can read and comment on the works here individually or as a member of one or more groups. You don’t have to join the network to read. You can go straight to our text of Walden, click on a paragraph, and read comments from readers who have posted to “General Discussion” or from our “Panel of Experts” — Thoreau scholars and others with specialized knowledge of Thoreau and his contexts. We’ve seeded our expert commentary with the annotations from Thoreau scholar and biographer Walter Harding’s Walden: An Annotated Edition (Houghton Mifflin, 1995), the rights to which were generously donated by Harding’s son Allen. As the author of the eminently readable The Days of Henry Thoreau and numerous other influential yet accessible works of scholarship, Harding, we believe, would have been pleased to see his original annotations reborn as conversation. If you do join the network, you can also join the conversation, both in the margins of our texts and in discussion forums. You can “follow” and “friend” other members of the network so that you’ll know when they’ve added something new to the conversation. You can send messages to friends or announcements to your groups. If you’re a teacher, you can request a group for your class. The group’s comments won’t be visible outside the group — unless, like Paul Schacht (SUNY Geneseo) and Kristen Case (University of Maine, Farmington), you set up your group to “read with” another, creating a conversation across classrooms and even across institutions. Have questions? If the help pages below don’t answer them, send us an email at contact@digitalthoreau.org.